When you tour Italy, there’s no shortage of charming Tuscan villas, historic hotels decked out in ornate finery and of course your standard run-of-the-mill chains. But what if you want something… different? 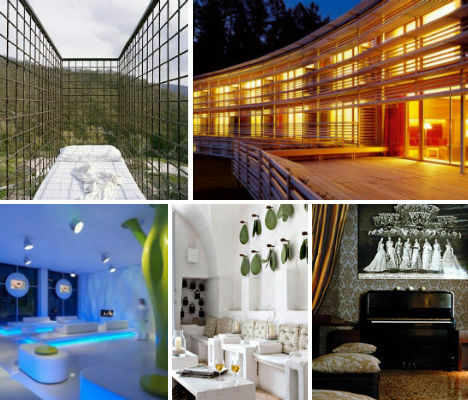 Whether off the beaten path or smack in the center of the most sought-after districts, these 15 design hotels, art hotels, boutique hotels and ski resorts represent some of the most stylish, modern, eye-catching and unusual lodgings in the nation. An 18th century farmhouse in the Puglia region, steps from the sea, is a Mediterranean dream with a bright, welcoming restored interior. 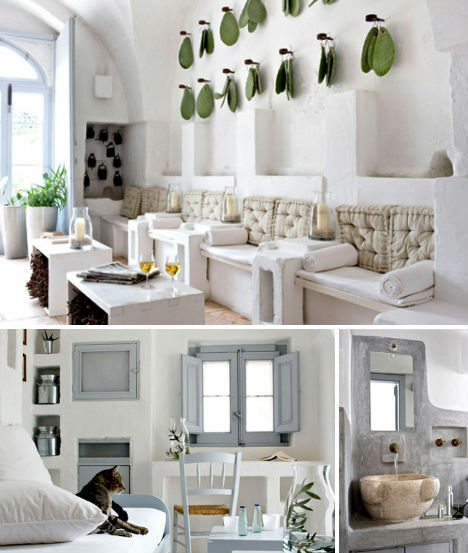 The subtle décor has a modern edge without losing the charm of its rustic origins, including springs of rosemary and olive leaves and lots of candles. The boutique guest house has 12 rooms and one spacious suite, ranging from €110 (about $155) to €590 (about $835). 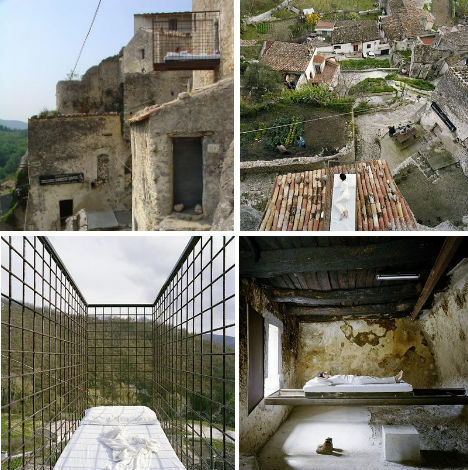 Where else can you sleep in a caged bed cantilevered from the side of a medieval building? 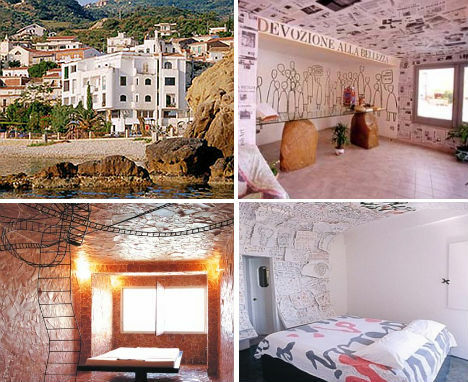 The Million Donkey Hotel, in the small town of Prata Sannita near Naples, is one-of-a-kind. Conceived as a sort of art experiment by Viennese design collective feld72, the dilapidated structure was transformed with the help of 40 local volunteers in an attempt to infuse new life into an area that has been all but abandoned by the younger generations in favor of modern cities. 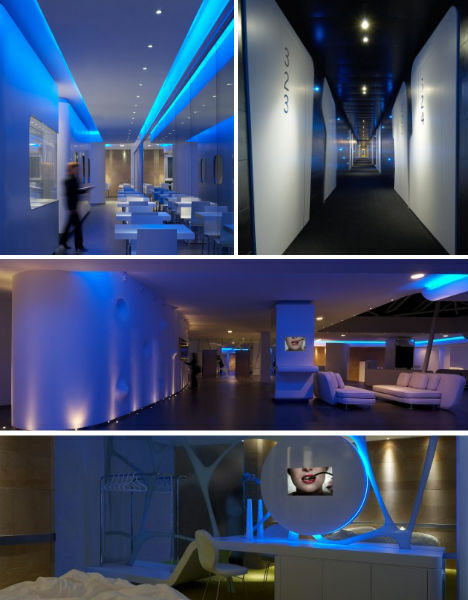 A five-star luxury hotel in Italy’s most modern city, Hotel The Gray is packed with interesting design details like floating stairs in each of its 21 individually designed guest rooms. Located in Centralissimo just down the street from the Duomo, the hotel treads the line between hip and refined, inserting selective pops of color into a relaxing gray-and-beige backdrop. Rates range between €300 (about $424) to €500 (about $707). In the heart of the Valpolicella region, the Byblos Art Hotel offers a stunning fusion of traditional and modern design, with its classic 15th century Italian villa exterior and brightly decorated interior. 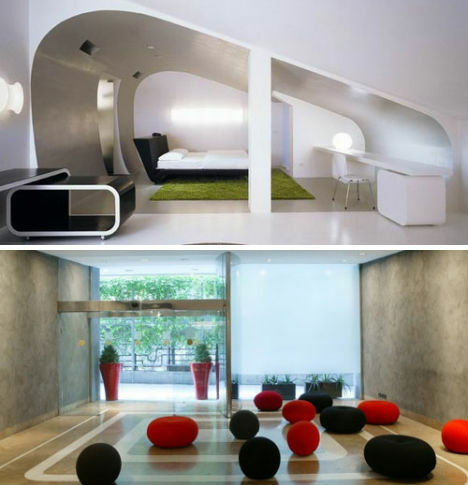 In fact, the hotel doubles as a museum of contemporary art with works from Frank Lloyd Wright, Anish Kapoor and Beatriz Millar. 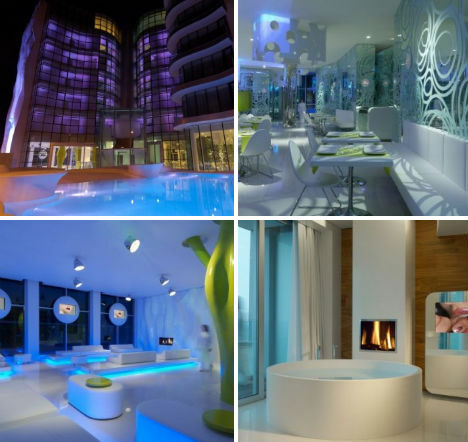 The hotel, which has its own spa, restaurant and poolside bar, offers complimentary transport to the town of Verona. Between Messina and Palermo on the coast of Sicily is Atelier sul Mare, another hotel/contemporary art gallery in a three-story Mediterranean-style building with plenty of terraces and large windows overlooking the sea. 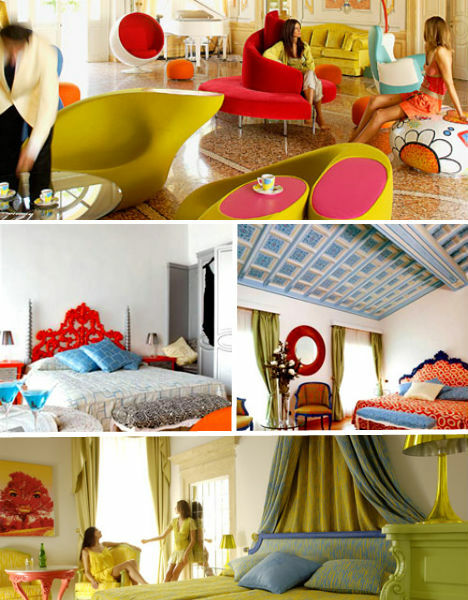 Twenty rooms have been individually designed by international artists, and there are an additional twenty standard rooms available. Much of the décor is influenced by the landscape in a modern and unexpected fashion – like an all black-and-red room reminiscent of lava and volcanic rock. When in Rome, you can stay at any number of classical-style hotels – or you can go against the grain and choose the Ripa Hotel, where modern minimalism trumps ornate embellishment. 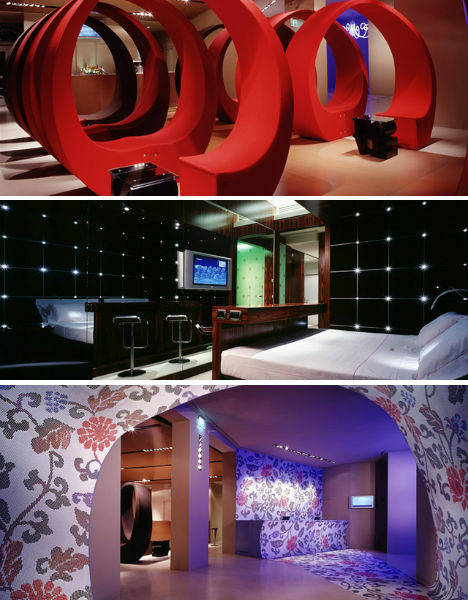 The boutique hotel, located in the Travestere district, has 180 rooms and its own soundproofed discoteque. 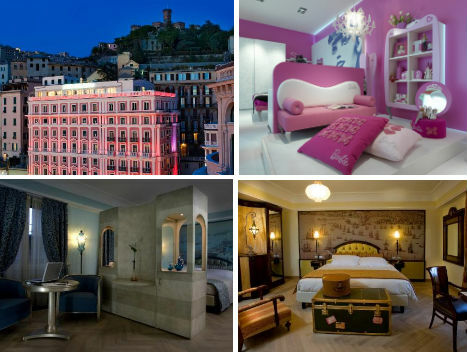 The Grand Hotel Savoia is a 5-star hotel in the historical district of Genova, a city perched on the harbor in Italy’s stunning coastal Cinque Terre region in close proximity to winter ski resorts. The hotel is comfy and well-appointed, but there’s one thing that really stands out: the Barbie Suite. Done up in pink and white, this room, designed in partnership with Mattel, looks like a Barbie dollhouse in human-sized proportions complete with a giant portrait of Barbie herself over the adult-length twin-sized bed. 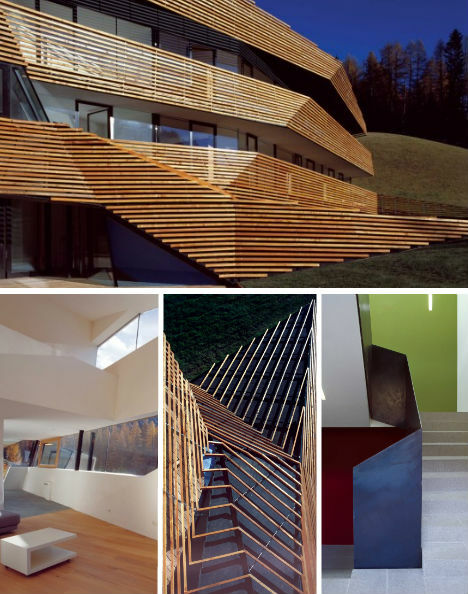 Architecture fans headed to the Italian Dolomites for winter sports should check out the Strata Hotel in Sesto (Sexten). The shape of the hotel, which is outfitted in a linear wooden facade made of local larch wood, was determined by local planning restrictions which make it seem like part of the hilly landscape, blending in quite well from afar. The guestrooms at the Strata are divided into family suites with living and dining areas and separate sleeping areas for children. Modern, but not minimalist? The Una Vittoria in Florence is contemporary luxe, giving a nod to Florence heritage with huge Italian Renaissance paintings mounted to the guest room doors in the hallways, but the visuals here are shaken up with glossy black wall tiles, lots of curving surfaces and two blood-red spiraling benches in the lobby. Located in a quiet residential area across the Arno, the Una Hotel Vittoria is a bit off the beaten path with rooms starting under $100 a night. 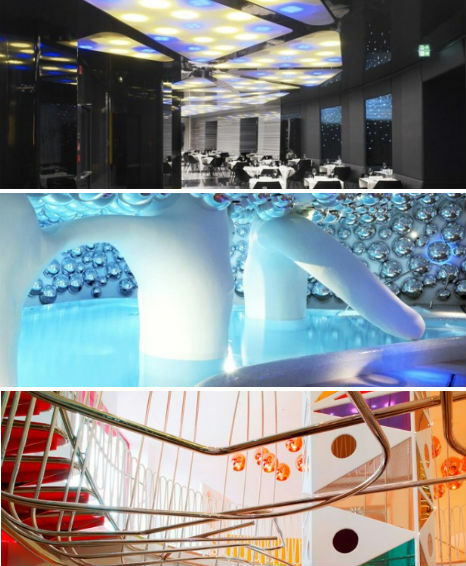 For an unusual experience in the Romagna region, try the i-Suite Hotel in Rimini, a design hotel with dreamy futuristic details that engage the senses. 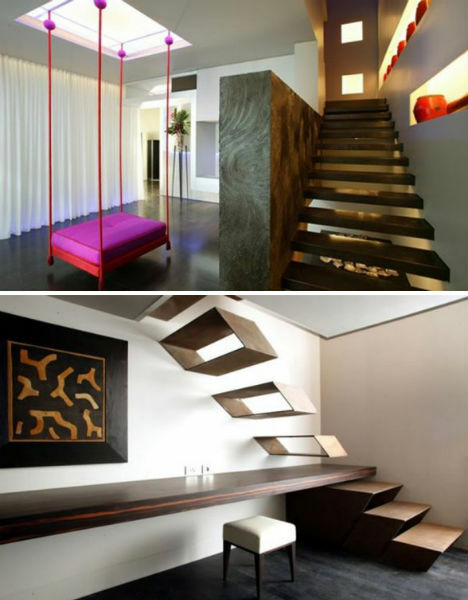 Says interior designer Simone Micheli, “I aim at making man the main focus of the attention by stirring up his senses by means of shapes, images, colours, lights, materials and by creating a scenario hovering among transcendence and immanence, concreteness and abstraction, dream and reality”. Wild and colorful, the Abali Gran Sultanato almost seems like a cartoon come to life – an exotic cartoon that brings Arabian visuals to Sicily. 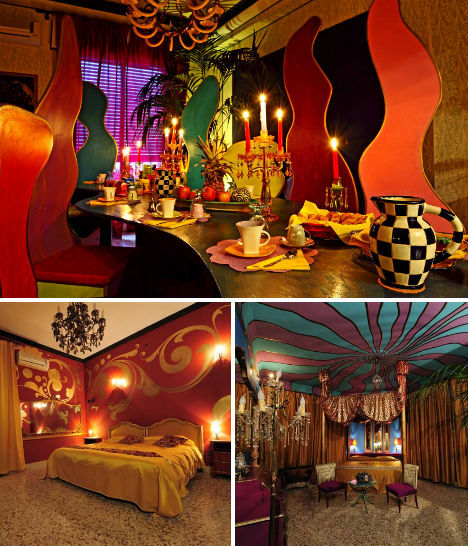 Sounds strange, but the Grand Sultanato is nothing if not vibrant, and rooms are a steal at €30 to €90 per person. Stay in a sleek five-star design hotel in the middle of Milan’s fashion district at the Exedra, housed in a former bank. Its luxurious spa, perfect for escaping the heat in Italy’s notoriously sticky summertime, includes a sauna, a Turkish bath and a bubbly futuristic underground swimming pool. The hotel has 146 casually elegant standard rooms and 18 themed suites ranging from ‘junior’ to ‘presidential’, with all décor made by Italian designers. With three restaurants and a series of public conference rooms, the hotel aims not to be just for travelers but to serve as a meeting place for the design-savvy residents of Milan. Directly facing the stunning Santa Maria della Salute church on the edge of a Dorsoduro canal, Ca Maria Adele is a glamorous way to experience the unforgettable city of Venice. Housed in a 16th century palazzo, this boutique hotel puts a modern spin on the old-world elegance of its historic setting. 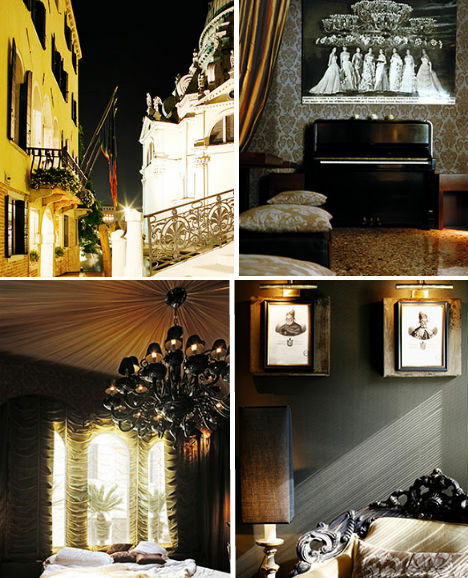 Each of the 14 rooms has been individually designed to reflect the city’s history. The location in a quiet arts district will make you feel like a local, and the bustling city center is just a gondola ride away. Northeast of Venice in the Italian Alps, there’s a region where the cultures of Italy and Switzerland collide, where you’ll hear not just Italian but French, German and a local language called Ladin. 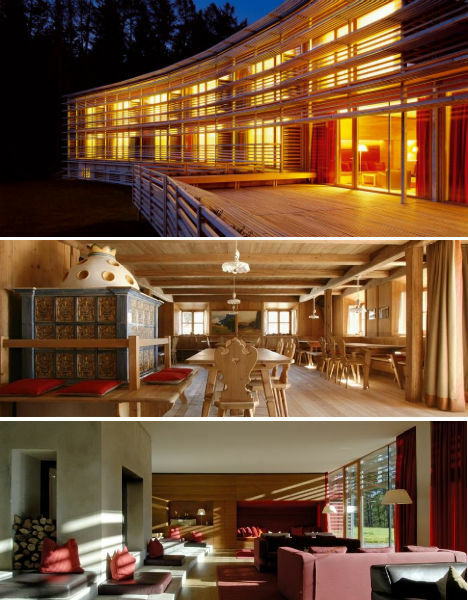 In these mountains, only after a long walk or a ride in a cable car, you can access a gem of modern architecture: the Vigilius Mountain Resort. Designed by Matteo Thun, Vigilius revels in its stunning secluded location, nearly becoming part of the landscape itself with its grass-covered roof. The resort has two restaurants, a library, a lounge and a spa as well as 35 standard rooms and 6 suites.